The small Jorja handbag packs a lot of punch for a purse made with such high principles. The shoulder bag shape is classic, but the crinkled texture of the material gives this Matt & Nat bag a slightly funky feel. 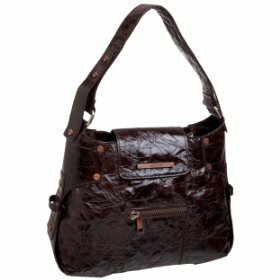 Copper-colored hardware perfectly complements the chocolate brown color of the vegan bag. The Matt & Nat Jorja handbag has two practical pockets on the exterior of the purse. The zippered pocket on the front and on the back add to the modern aesthetic of the bag. A magnetic flap closure shows the designer logo and covers a zipper closure. In addition to chocolate brown, the Jorja bag is also available in grey and magenta. With this Matt & Nat bag, you'll ease your animal-friendly conscience and add tons of eco-chic style.